listings, this book is for anyone looking to live above their means without debt. - Publisher In Five-Star Living on a Two-Star Budget, Margaret Feinberg and Natalie Nichols Gillespie divulge their secrets for fulfilling dreams of travel, fashion, entertainment, and dining. You will discover insider's secrets, including:*shopping tips for those who prefer Prada to Payless and Gucci to Goodwill *planning the trip of a lifetime for a fraction of the cost *terrific treats for tots to tweens *how to enjoy fine dining more often for less money *simple tricks to save on big-ticket items In addition, the authors share their "Live It! Give it!" principles, helping readers embrace a Five-Star lifestyleliving more and giving moreon less! Designed with boxed tips, quick facts, and website listings, this book is for anyone looking to live above their means without debt. 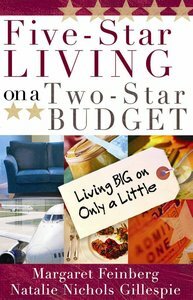 About "Five-Star Living on a Two-Star Budget"
In Five-Star Living on a Two-Star Budget, Margaret Feinberg and Natalie Nichols Gillespie divulge their secrets for fulfilling dreams of travel, fashion, entertainment, and dining. You will discover insider's secrets, including:*shopping tips for those who prefer Prada to Payless and Gucci to Goodwill *planning the trip of a lifetime for a fraction of the cost *terrific treats for tots to tweens *how to enjoy fine dining more often for less money *simple tricks to save on big-ticket items In addition, the authors share their "Live It! Give it!" principles, helping readers embrace a Five-Star lifestyleliving more and giving moreon less! Designed with boxed tips, quick facts, and website listings, this book is for anyone looking to live above their means without debt.